Complete your decor with this handsome demilune style table. This soft silhouette is perfect for that tight area in a hallway or stair landing. 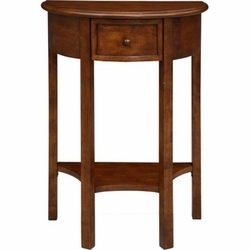 Petite in size and generous in quality with long-lasting solid hardwood construction, hand-applied finish, and dovetail drawer design with a display shelf ensures many years of enjoyment. Comes fully assembled for your convenience. • Birch solids and veneer construction.